Today I uploaded a new version of Remote Manager, 1.0.0.5. I have been using Remote Manager daily at my normal job, and the interface just didn’t handle the sheer number of server connections I now need to make to complete my duties. Due to this, I took some time and implemented a new feature to allow grouping of connections. 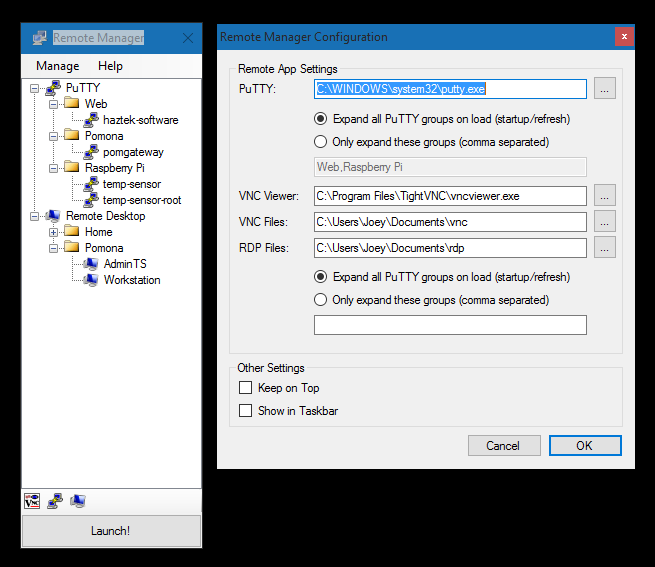 You can now move PuTTY/SSH connections among various groups, and then in the application configuration decide whether you want to expand or contract individual groups. The same grouping feature has been added for Remote Desktop connections as well. It’s as simple as making sub-directories in your configured RDP folder and populating those sub-directories with your RDP documents. The user interface for the application slightly changed due to the way newer versions of Windows handle borderless, titleless forms. The application otherwise works exactly the same way it always has. Hopefully you will find the new changes to the application as helpful as I do. Happy remoting!